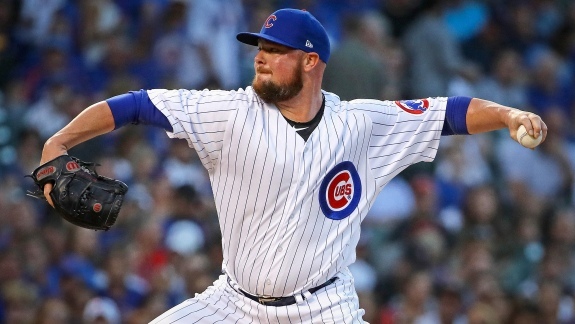 On Monday night, Chicago Cubs starting pitcher Jon Lester proved more deadly with a bat in his hands than on the mound. Beating this year's incarnation of the New York Mets (58-73, .443) does not carry the same weight as it did three seasons ago when they won the National League pennant. Despite trailing the Atlanta Braves (73-57, .562) in the National League East by 15 1/2 games, the Mets still have two of the most formidable pitchers in the game. Last night, the Chicago Cubs (77-53, .592) jumped on starting pitcher Noah Syndergaard (9-3, 3.51 ERA) and defeated the Mets, 7-4. With the St. Louis Cardinals (73-58, .557) and Milwaukee Brewers (73-59, .553) dormant on Monday, the Cubs extended their division lead to 4 1/2 and five games respectively. While Jon Lester (14-5, 3.67 ERA) did not have a lights-out performance on the mound, he proved dangerous offensively by going 1-for-2 with two runs batted in. This evening, the Mets will send 30-year-old Jacob deGrom (8-8, 1.71 ERA) to the mound. As one the leading contenders for the National League's Cy Young Award, deGrom will duel with 34-year-old Cole Hamels (9-9 3.82 ERA). Hamels provided a much-needed jolt to the Cubs pitching staff since being acquired from the Texas Rangers prior to the non-waiver trading deadline. Since joining the Cubs, Hamels made five starts. During that stretch he's pieced together a 4-0 record and a 0.79 ERA. His last start was a complete game against the Cincinnati Reds (56-75, .427), the first for the team all season.